Friday, 15 June 2018 was World Elder Abuse Awareness Day (WEAAD). This annual event acknowledges the prevalence of elder abuse, educates communities and individuals to recognise the signs, and encourages loved ones and victims to speak up and seek support and assistance. So, what is elder abuse and what can you do about it? It’s hard to imagine that somebody would harm, intimidate or take advantage of an aged and vulnerable person. Unfortunately, however, elder abuse occurs within our society and sadly, the perpetrators are often those entrusted with caring for our older generation. financial exploitation – unauthorised use of a person’s property or money. The conduct causing the harm is usually carried out in circumstances where there is an expectation of trust between the victim and perpetrator who is, ironically, often a caregiver or family member. According to the Australian Law Reform Commission’s 2017 National Legal Response to Elder Abuse, psychological abuse and financial exploitation are the most common types experienced and, in many cases, these categories co-exist. Specific examples of psychological abuse include bullying and harassment, treating an elderly person as a child or as somebody lacking intelligence or mental capacity, threatening to send the person to a nursing home or depriving him or her of seeing certain family members or friends. pressuring a person to give a power of attorney or appointment of an enduring guardian. In Western Australia, there are several centres, helplines and resource units to assist those experiencing or affected by elder abuse as well as tribunals or courts that deal with disputes and issues concerning allegations of abuse. If you are a victim of elder abuse you can speak with somebody you trust about your concerns, obtain advice from one of the organisations linked below, or contact a lawyer. If you suspect somebody you care about is a victim of elder abuse you should raise your concerns with that person before suggesting a plan to obtain help and move forward. You may notice an elderly friend or relative becoming reclusive or missing social events, having insufficient funds to pay for necessities or outgoings (particularly when compared with their financial position), suddenly becoming friendly with a new carer or a person showing special interest in the elderly person, hovering around or constantly speaking for that person. Because the purported abuser is often a relative or somebody presumably close to the older person, it can be difficult and challenging to identify and address cases of elder abuse. It is even more complex if the alleged abuser has been appointed power of attorney for the victim. 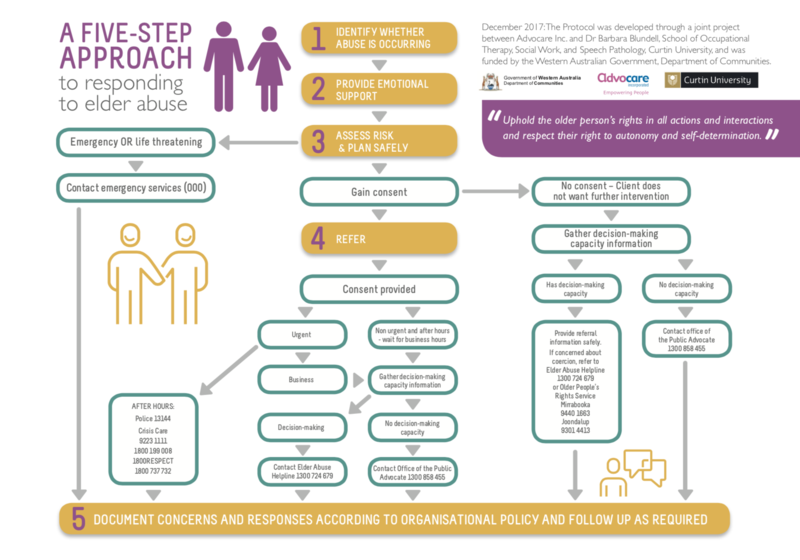 Sometimes the older person may not even realise they are the subject of abuse as they may be quite dependent on their perpetrator or may have some degree of mental incapacity. In such cases, it is wise to seek advice from a lawyer. Appoint somebody you trust, whether that be a friend or family member, to be your power of attorney and enduring guardian. Talk to your lawyer about the types and scope of power/guardianship you would like to give this person and in what circumstances they may exercise the power. You can appoint different people for different roles, more than one person, or alternate people. Ask plenty of questions and be sure that you fully understand the appointment before signing anything. Consider putting in place an advance health care directive setting out your wishes and directions regarding your future health care if you become unable to make those decisions yourself. Do not agree to lend money, or to transfer or mortgage significant assets without obtaining independent legal advice and having the transaction documented in writing. Your lawyer should be independent (not chosen by the person to whom you are lending money). Advice should be provided to you alone and not in the company of the proposed borrower or transferee. If you decide to gift money, talk to Centrelink or a financial advisor first so you understand the effect this may have on any pension. Ensure you have a valid Will, that you understand the effect of the Will, and that you know where the original can be located. Review your Will regularly to ensure it reflects any changes in your circumstances or your choice of executor and/or beneficiaries. If something doesn’t sound right, there’s a good chance it isn’t right. Speak up, tell somebody you trust, or call a support service. Elder abuse is a highly-concerning social justice issue and demands further attention and inquiry. Public education, particularly regarding our ability to identify and acknowledge elder abuse, is crucial to ensure these injustices can be addressed and remedied. Older generations should be empowered by learning about the steps they can take to protect themselves and knowing who they can turn to for help. If you or someone you know wants more information or needs help or advice, please contact us on (08) 9380 9288 or email office@dclawyers.com.au.